Anyway, the link to the recipe is here. 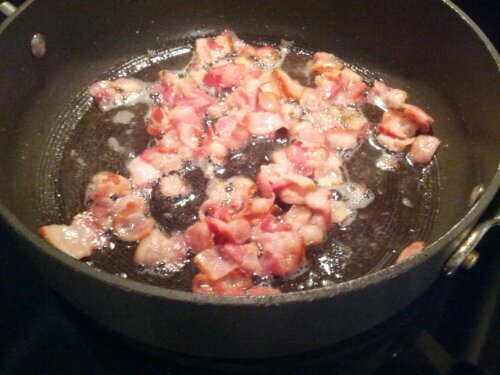 Basically you cut bacon into 1/2″ pieces and fry them. 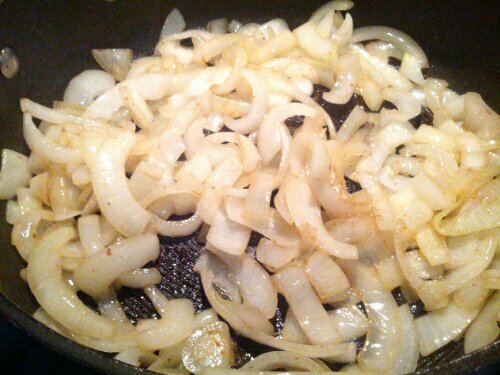 You take the bacon out of the pan and almost all of the bacon grease but leave a tablespoon because you’ll be frying 4 small onions in that grease. You fry them over medium high heat for about 8 minutes & then add some thyme (tablespoon) & salt (pinch). Then you reduce the heat to medium low and cook them until they’re really brown and soft (the recipe says 20 minutes but I took them off the heat before that because I was getting scared they would burn) (and actually before that I added two tablespoons of butter for the same reason!). 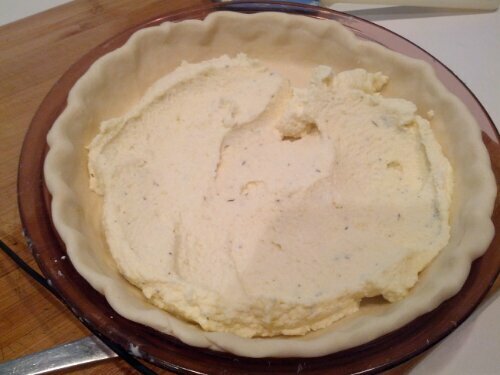 While that’s going on, take a cup of whole milk ricotta & an egg yolk, a little thyme, a pinch of salt & 1/4 cup of grated Parmesan cheese and mix them all together. 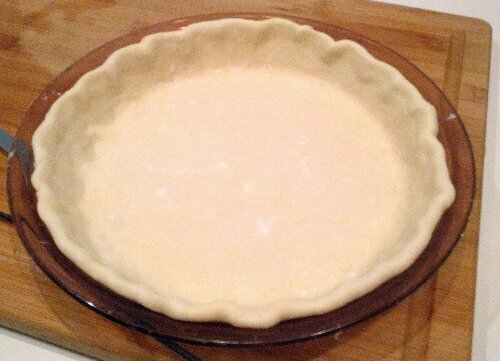 Spread that mixture evenly across the tart shell. 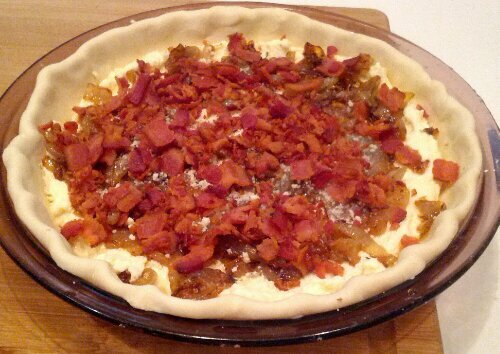 Sprinkle the onions over the cheese mixture. 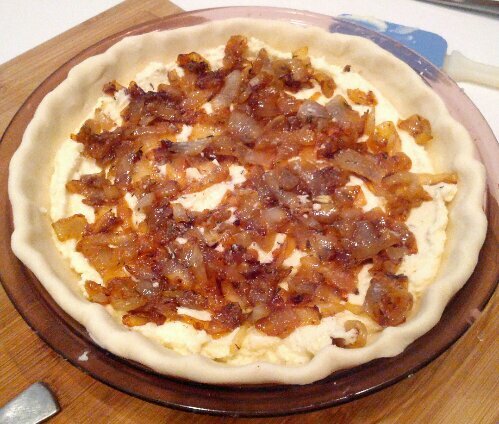 Sprinkle a tablespoon of grated Parmesan cheese over the onions. 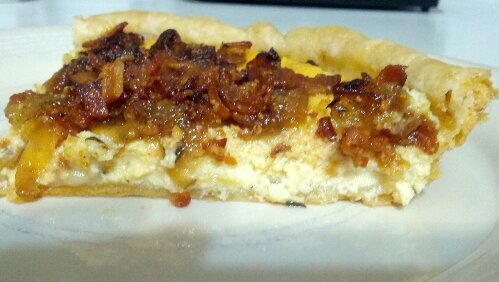 Then top with the crispy crumbled bacon. Then you bake it at 350° for 30-40 minutes (until the edge of the mixture starts to brown). You might have to double check the recipe for the baking part because I haven’t put it in the oven yet so I might not have memorized that exactly… But I can’t wait! 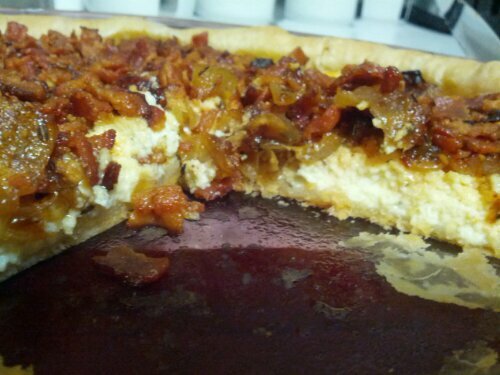 I love bacon & onion together… And ricotta too? Oh man, this is gonna be good!!!! I was too excited to share this so that’s why I’m posting even before I’ve tried it. How could it be bad?!? Yum. 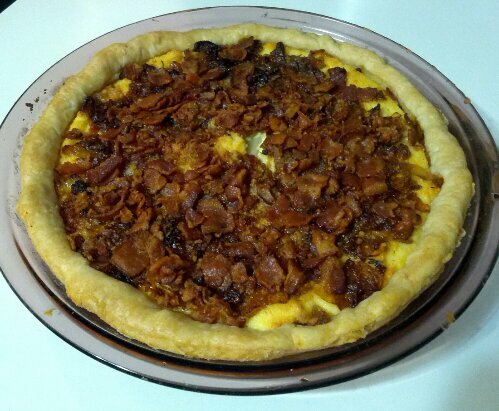 Crust, bacon, onion, and cheese. Also, I know what you mean about loving your food processor. I use mine for just about everything! A food processor opens up a whole world of possibilities… AND allows you more time to explore those possibilities!